We are quickly becoming aware of the concerns to protect our environment and ecological development. When it comes to building or constructing helical pile foundations in sensitive areas such as wetlands, marshes, bogs, beach or lake fronts, AB Chance helical pier foundation systems have been recommended as a safe approach to constructing with minimal impact to the ecological habitat. We have worked with audubon societies and conservation commissions to build boardwalks, docks and bike or hiking trail bridges that pass through wetlands. Have a look at the brochure on this page that offers technical information on helical piles for nature trail footbridge/boardwalks. 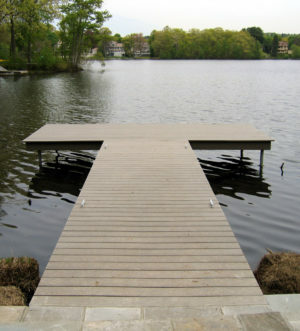 Helical piles are also suitable for docks and beach stairs in sandy shorelines. 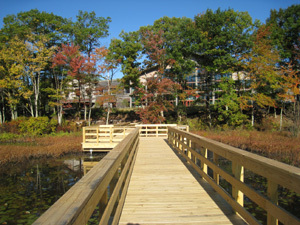 The before and after of the boardwalk being built behind Bass Pro Shop in cranberry bog at the Patriot Place in Foxborough, MA. It's proven most economical in sensitive soils and difficult terrain. The galvanized steel anchors are pre-engineered to transfer projected loads to bearing-capable layer beneath the soft silty soils. This isolates the structure's integrity from seasonal changes in the surface-layer conditions. 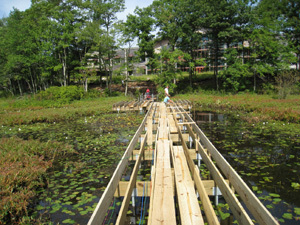 If you're dedicated to protecting the ecosystem in wetlands, you need to consider the proper construction method to install your pedestrian trail bridge. To learn more on how to design and construct boardwalks and bridges with helical pile foundation support, please fill out our form to contact our helical pile specialist.